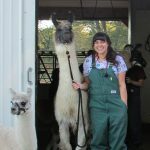 Florina Tseng, DVM, wears many hats. A celebrated expert in wildlife medicine, Dr. Tseng serves as an Associate Professor and Associate Chair of the Department of Infectious Disease and Global Health. 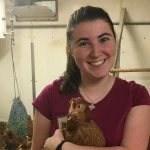 She’s also on the Cummings School of Veterinary Medicine at Tufts University admissions committee, serves as the Director of the Tufts Wildlife Clinic, and is an active wildlife consultant. Dr. Tseng is a committed educator. 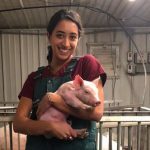 Her varied roles allow her to work with DVM students, residents, clinicians, researchers, undergraduate volunteers, and even high schoolers who participate in the Adventures in Veterinary Medicine High School Program. “First and foremost, I’m a teacher and mentor,” she says. She loves every moment of it. Mentoring students includes overseeing student-initiated summer research projects. “The veterinary medicine community is relatively small. We know each other. I enjoy using my connections to set up opportunities for my motivated students,” Dr. Tseng explains. A few recent examples include a student studying sea turtles in Georgia, a student working with fruits bats in Bangladesh, and a student who discovered a new parasite in South American fur seals at Marine Mammal center in Brazil. Dr. Tseng guides students through proposal process, travel requirements, research development as well as through the presentation and publication of findings. As Director of the Wildlife Clinic, Flo Tseng oversees clinic operations. The Wildlife Clinic is one of just a handful of stand-alone academic wildlife clinics in the country, and is a required two-week rotation within the Cummings School’s clinical year for D.V.M. candidates. Dr. Tseng instructs students during their rotations at the clinic. 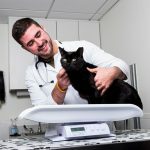 “The Wildlife Clinic is just one way we connect research and practice. We have a unique opportunity because of the large and varied caseload of patients seen at the Clinic,” states Dr. Tseng. Dr. Tseng’s interest in the subject of analgesia in wildlife patients has led to the development of a research project mapping opioid receptors in the brains of red-tailed hawks. Her hope is that data collected from Wildlife Clinic patients will create and better inform analgesic protocols in clinical patients. 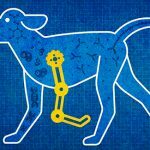 Recognizing, managing, and relieving pain improves outcomes and helps speed recovery from surgery, injury, and disease in any animal. Dr. Tseng received her D.V.M. from Cornell University in 1981. Before joining the Cummings School in 2000, she worked in small animal and exotic private practice and then completed an internship in wildlife medicine at the Wildlife Center of Virginia. After her internship, she was the Director of Veterinary Services at a large rehabilitation center near Seattle. At that time, she became the Research Director and Staff Veterinarian for International Bird Rescue Research Center (IBRRC) in Berkeley, California. IBRRC is internationally renowned for their expertise in treating wildlife suffering from the effects of oil spills. In addition to her interest in the use of analgesics in wildlife species, and the ecological factors contributing to wildlife morbidity and mortality, Dr. Tseng’s expertise lies in seabird rehabilitation and the effects of petroleum on these species. She is one of the principal investigators of Tufts CCM’s Seabird Initiative, which has established SEANET, a regional seabird population and mortality monitoring program. Dr. Tseng is still an active consultant and leader is this field and was in Gulf after the 2010 spill. Dr. Tseng also serves as a consultant for the U.S. Fish and Wildlife service.